In the practices of factory operations, the nature of raw materials is closely related to product quality whatever products are manufactured; therefore, formulating effective supplier and quality evaluation is essential. Additionally, due to recent information about problematic raw materials, the brands are only protected under the umbrella built by tracing back to and taking control of supplier managing ability as well as material quality. ArgoSQM (Supplier Quality Management) System is the best assistant to help break through the blind spot of external supply chain quality control and provide high-quality products. Strictly control supplier evaluation and audit plans is a must to guarantee the basic quality of products. In the evaluation process, electronic and paperless operations are achieved by effectively controlling schedules, setting expiration notices, as well as filing relevant working records and documents along with functions such as online approval process. Since material standards and testing rules are different with the requirements of different industries and products companies can adjust default testing rules according to realities. ArgoSQM also can automatically judge the testing results followed by rules such as ISO. 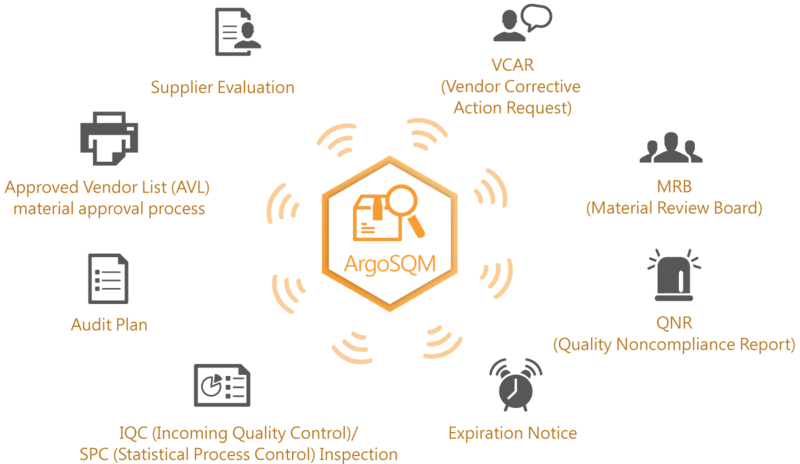 When raw material problems happens in the production process, besides issuing alerts, ArgoSQM provides an active and timely communication tool to rapidly link information between internal departments and suppliers to have production problems taken a turn for the better.